Sitting in my kitchen at the moment is my first attempt at this Banana and Raisin Loaf courtesy of Deliciously Ella. As I subscribe to her blog, the email had only dropped into my inbox a couple of days ago and immediately this ‘delicious’ looking loaf caught my eye. This is a delightfully moist bread almost reminiscent of the old-fashioned bread pudding I used to make using “proper” bread (not this imitation steam-baked stuff we can buy nowadays). I ate the end slice whilst still hot from the oven and immediately developed hiccups (I should have left it to cool down). It slices perfectly once cold and although absolutely yummy on its own, could be served up with some nut butter or honey. Mash the bananas with a fork or with a mixer and put them in a large bowl. Grind the oats into a flour in a food processor. Melt the coconut oil then mix all ingredients together. Grease a loaf tin with a little coconut oil (the base of my tin was 20cm x 9cm). Add the mix to the tin and bake for 50 minutes at 180° or until a knife comes out clean. Allow to cool in the tin for at least 30 minutes to finish setting. Turn out and try to leave until cool before slicing and eating. 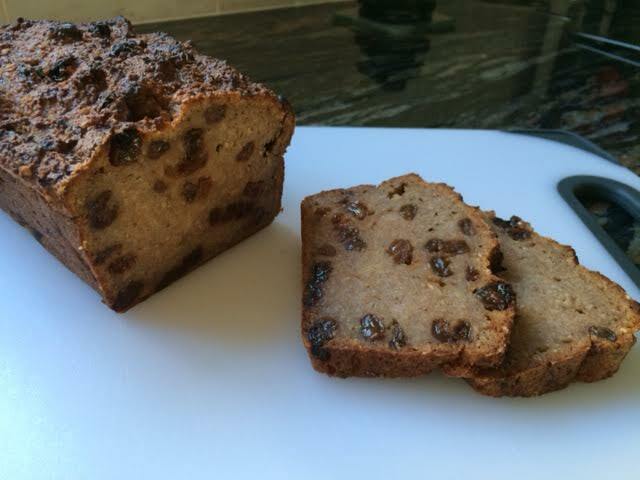 This entry was posted in Breads, Sweets and Treats and tagged Banana Raisin, Cooking, Healthy Eating, Recipes, Wheat-Free. Bookmark the permalink.